↑ Mui, Yian (February 2, 2014). 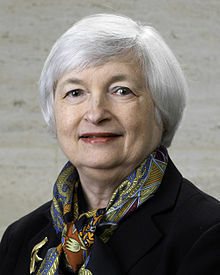 "New Fed Chief Janet Yellen lets a long career of breaking barriers speak for itself". Washington Post. ↑ Lowrey, Annie (January 6, 2014). "Senate Confirms Yellen as Fed Chairwoman". New York Times. Retrieved January 6, 2014.